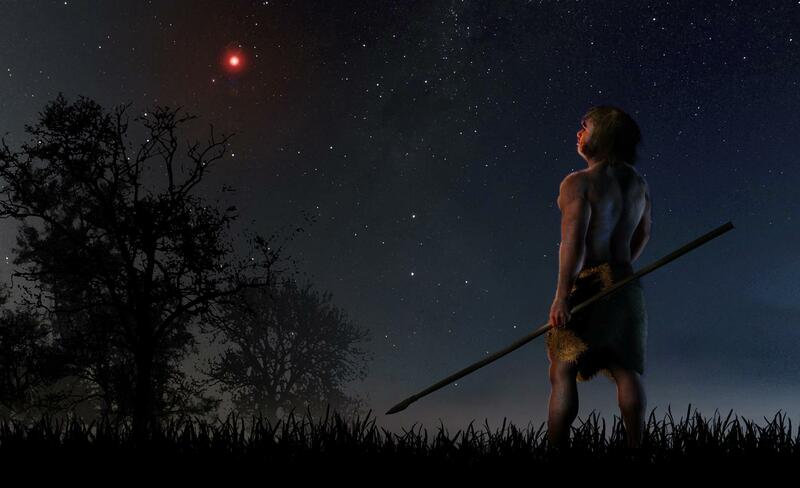 About 70,000 years ago, when the human species was already on Earth, a small reddish star approached our solar system and gravitationally disturbed comets and asteroids. Astronomers from the Complutense University of Madrid and the University of Cambridge have verified that the movement of some of these objects is still marked by that stellar encounter. At a time when modern humans were beginning to leave Africa and the Neanderthals were living on our planet, Scholz's star – named after the German astronomer who discovered it – approached less than a light-year from the Sun. Nowadays it is almost 20 light-years away, but 70,000 years ago it entered the Oort cloud, a reservoir of trans-Neptunian objects located at the confines of the solar system. "Using numerical simulations we have calculated the radiants or positions in the sky from which all these hyperbolic objects seem to come," explains Carlos de la Fuente Marcos, who together with the other coauthors publishes the results in the MNRAS Letters journal. "In principle," he adds, "one would expect those positions to be evenly distributed in the sky, particularly if these objects come from the Oort cloud; however, what we find is very different: a statistically significant accumulation of radiants. The pronounced over-density appears projected in the direction of the constellation of Gemini, which fits the close encounter with Scholz´s star." The moment in which this star passed close to us and its position during prehistory coincide with the data of the new investigation and in those of Mamajek and his team. "It could be a coincidence, but it is unlikely that both location and time are compatible," says De la Fuente Marcos, who points out that their simulations suggest that Scholz´s star approached even more than the 0.6 light-years pointed out in the 2015 study as the lower limit. The close fly-by of this star 70,000 years ago did not disturb all the hyperbolic objects of the solar system, only those that were closest to it at that time. "For example, the radiant of the famous interstellar asteroid` Oumuamua is in the constellation of Lyra (the Harp), very far from Gemini, therefore it is not part of the detected over-density, "says De la Fuente Marcos. He is confident that new studies and observations will confirm the idea that a star passed close to us in a relatively recent period. Scholz´s star is actually a binary system formed by a small red dwarf, with about 9% of the mass of the Sun, around which a much less bright and smaller brown dwarf orbits. It is likely that our ancestors saw its faint reddish light in the nights of prehistory. References: C. de la Fuente Marcos, R. de la Fuente Marcos, S. J. Aarseth. "Where the Solar system meets the solar neighbourhood: patterns in the distribution of radiants of observed hyperbolic minor bodies". MNRAS Letters, 2018.